Learn more about Topic (Mars) at Snackabase.com! 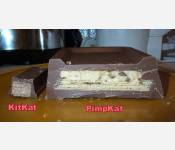 It’s literally taken me four weeks to decide what chocolate bar to base this pimp on. I had the idea of making something with chillis in it, and then drawing flames on, a while ago, but couldn’t think of a decent pun for any chocolate bars. We pondered a Fuse, and at one point, shock horror, even decided not to give it a pun name. My brother-in-law even suggested a Picnic, but with sick in it, i.e. a Sick-nic, but in the end, after 2 glasses of white zinfandel (my husband never drinks wine and I think it went to his head) Ian decided on the Hot Topic. I had completely forgotten what was in a Topic as well, so after finding them, I bought ingredients which seemed to fit the description of a Topic as written on the packaging. The only one I couldn’t decide on was the caramel, but after remembering my dad boiling condensed milk to make banoffee, I found a tin of it, and adapted the recipe on the side. After looking at a Topic, for all of 2 seconds, I could see that the basic shape is actually quite square, although rippled on top. 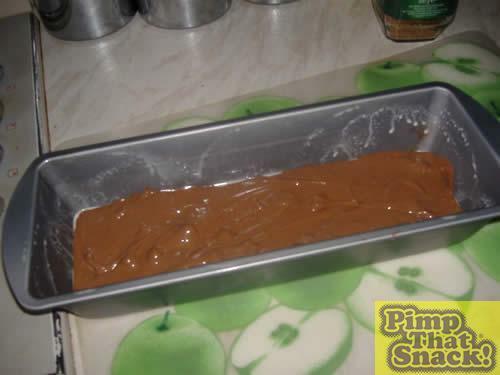 I decided to use my trusty Kit Kat shaped loaf tin, and then add ripples afterwards. Hopefully I could make the ripples look like flames too. 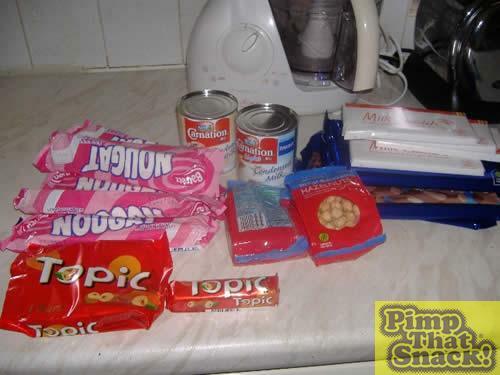 The first job was to create a layer of chocolate for the top. As usual, I melted chocolate in the microwave, poured it in the tin, and froze it. 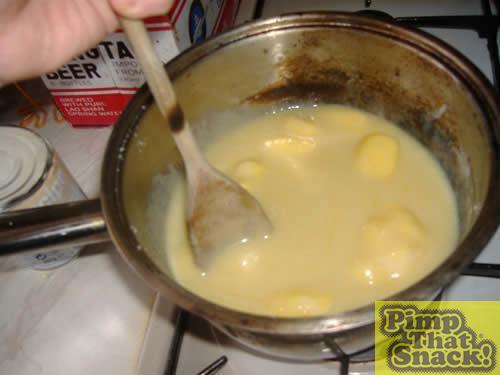 To make the caramel, I melted the butter and sugar, then stirred in the condensed milk, and brought it to the boil. Once boiling, I added the lazy chillis and habanero sauce, and the bag of hazelnuts, and left it boiling for 5 minutes, stirring constantly. This is tricky stuff. Leaving it for even five seconds made it burn and stick to the pan, so watch your fingers and your pan, especially if it isn’t yours. 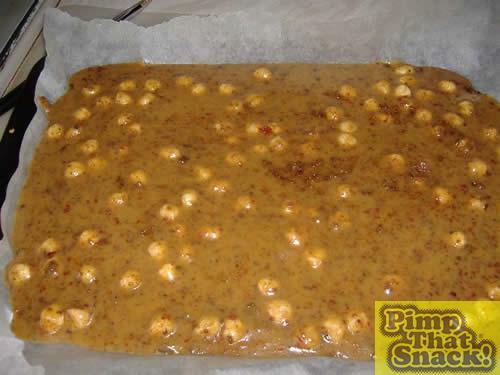 Instead of just pouring the hot caramel into the mould, which would mean I might not get the gap around the edge to fill with chocolate, I spread it on greaseproof paper on a baking tray, and left it in the fridge to cool. 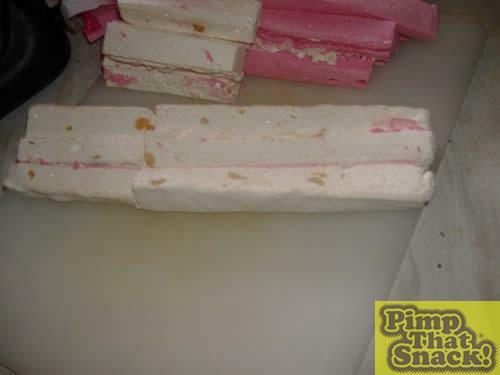 Nougat is pretty hard to find, unless you get jumbo pink and white nougat. I am a bit of a pedant, and don’t like to see pink nougat when the real chocolate bar only has white nougat. So, while the caramel cooled, I cut the pink half off the nougat, and arranged the 6 white bits to make the correct size and shape.